H. Rick Bamman - hbamman@shawmedia.com Iron workers guide a beam into position at the new Centegra medical office building adjacent to Centegra Hospital - Huntley. The building on Haligus Rd. will house additional medical professionals. 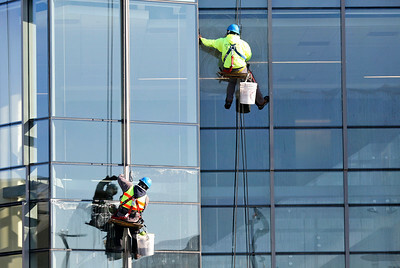 H. Rick Bamman - hbamman@shawmedia.com Workers from Superior Labor Solutions hang from bosun chairs as they clean windows at the new Centegra Hospital in Huntley on Tuesday, April 5. 2016. Centegra Hospital-Huntley is scheduled to open this summer will be a 360,000 square-foot, 128-bed facility. 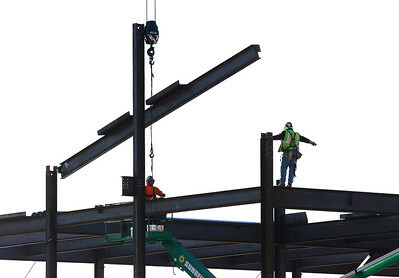 Iron workers guide a beam into position at the new Centegra medical office building planned to house additional medical professionals adjacent to Centegra Hospital - Huntley. Iron workers guide a beam into position at the new Centegra medical office building adjacent to Centegra Hospital - Huntley. The building on Haligus Rd. will house additional medical professionals.